DD eldest has reminded me that I haven’t posted in awhile. I have been having a good spell with my illness, and have been more involved in real life than in online life. I haven’t felt this well in a very long time, so I am taking advantage of it. I’ve been decluttering more, went through my crafting supplies and gave away some things I no long have any use for. Been getting out and enjoying the gorgeous weather we’ve been having, although it is cooler and rainy today. That’s okay. I love rain. My windows have stayed open for about a week. Fresh air, only slightly tinged with the exhaust from all the cars that travel right underneath my windows. I live right next to a very busy street in the center of downtown. 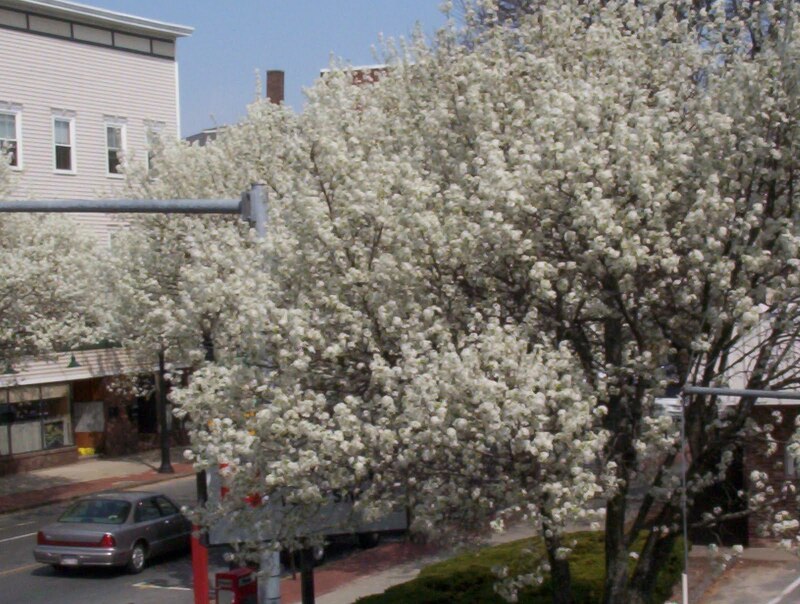 Two days ago, the flowering pear trees suddenly popped out their flowers. Yesterday, they were in their full glory. I took several pictures. The flowers are right at eye level from my apartment, and it is such a pleasure to glance out the window and see masses of white blooms. In spite of feeling so much better, I am still having lots of problem with my legs. They just seem to hurt almost all of the time, and walking is difficult and very painful. I’m not sure what to do about it. Anyway, it’s really spring here in Massachusetts, and I am happy. >I'll make a point of sending light to your legs next go-'round. 🙂 Also, I'm THRILLED you're having such great days! >Thanks. Me, too. Did you click on the picture? It's gorgeous in big size. >Hadn't, but did now. 🙂 Miss the town, believe it or not. *L* Miss picking berries!!! Remember the guy that had shell-shock who walked up and down the street on your side talking to himself? Eons ago, it seems like. >Nearly drowned? Srsly? I do't think so. LOLThe park is farther down on the west side of my street. My windows face North only. I'd love to do a picture of the week, if only I remember. I miss picking berries, too. I think of it everytime I go down Route One, and on the odd occasions I get to go onto Upper High Street. Kind of surprised you remember that. >How could I NOT remember that? *L* And we used to pick by…argh, can't remember the store's name…was next to *giggle* Piggly Wiggly. There was a hedge of, I think, blackberries.Also remember all the apples (oy!) and pouring maple syrup on snow. :)Yeah, I am serious about nearly drowning…ok, couldn't find my way out of the pool (kept diving down towards the bottom) and when I finally did they yelled at me for screwing around. Couldn't breathe at that point. >Ask Kris…there WAS a Piggly Wiggly.